Despite what the picture portrays, this meal was absolutely delicious! It was simple, tasty and we loved it (plus it made great leftovers). A great, easy dinner that I will be making time and time again! Bring a medium pot of salted water to a boil over high heat. Add the pasta and cook until just tender, stirring occasionally, about 5 minutes. Drain pasta into a large mixing bowl. Meanwhile, put the olive oil in a medium saute pan over medium heat. Add the chicken and cook for 3 minutes. Add the onions and garlic, stirring to combine, and cook until the onions are soft and the chicken is cooked through, about 5 minutes more. Put the chicken mixture into the bowl with the cooked pasta. Add the canned tomatoes, mozzarella cheese, parsley, salt, and pepper. Stir to combine. Place the mixture in a buttered 8 by 8 by 2-inch baking dish. 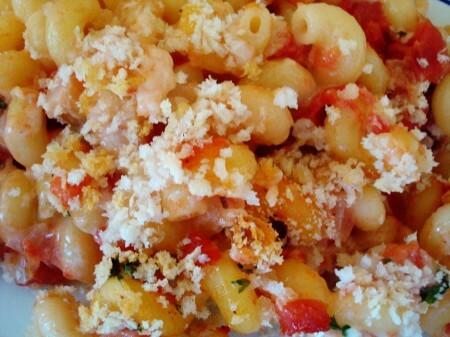 In a small bowl mix together the bread crumbs and the Parmesan cheese. Sprinkle over the top of the pasta mixture. Dot the top with small bits of butter. Bake until the top is golden brown, about 30 minutes. I know you are a busy lady, but I can’t access this recipe for Italian Chicken Pastina. Can you help me out? Uh oh – let me look into it! I am SO grateful that I found your blog – this recipe was another big hit with my family. I made it tonight and it was SO YUMMY. I am not a cook, so I appreciate how simple and no-fail your recipes are! Margaret – thanks for checking back in to let me know you liked this dish. It is always a hit with my kids, too. Good tip on doubling and the amount of tomatoes you used. Thanks! This looks delicious! I am totally going to try it! yumm! Melanie – glad you liked this! Thanks for checking back in to let me know. lunar daughter – oh, that makes sense! Funny how the connections are made…small world. Thanks for your compliments! lunar daughter – thanks for your comment! Who is your sister-in-law?? Thanks for mentioning the serving size – I would say this could definitely serve 4 easily and 6 if you had a side dish or two. I always think that pasta makes great leftovers. This sounds so delicious! I just made this tonight for my family and we loved it! I added a little bit of pasta sauce to the dish just to add a little more sauce and it turned out great. Thanks for the recipe! Mmm . . . I want to come eat at your house! Hey Becky – thanks for letting me know when you try recipes. I appreciate it (even if the results aren’t perfect!). I’m glad you liked this! this was so good. I made it for us/my in laws and my bro and sis in law-so 6 adults and 3 kids (3,2,1). And we scarfed it up. The kids loved it-the tiny pasta was a huge hit. I doubled the recipe and used a 28 oz can of crushed tomatoes and a 14.5 can of diced tomatoes. We ate it with garlic bread and steamed green beans. I’m thinkin’ that picture looks pretty yummy!! I am having so much fun trying your recipes. We made this tonight and it was a hit with us and the kids! Yum-Yum! Thanks! Melanie, I love your recipes, thank you for posting them. My SIL is your neighbor and I’m so glad she told me about your blog.Anyway, I was wondering how many you think this will serve? I’m guessing 4 maybe? Melanie, after reading more of your blog, I think my sister-in-law is a neighbor to your SIL Erin’s sister Melanie. I know, that’s confusing. Anyway, I came here by way of The Sister’s Cafe. I love your site and have printed off many recipes to try out. Everything we’ve tried so far, we have loved. Thanks for sharing! Jan – thanks for commenting! Your comment was sweet and I appreciate it. I’m also really glad you liked this meal – we eat it a lot because it is simple and delicious! I think I need to make this for dinner tonight. Sounds delicious and just what I’ve been craving!